The homes for sale at StrawBerry Ridge offer a surprising value to adults 55 and older who are seeking to enjoy their second act in beautiful Central Florida. Located a short drive from Tampa, StrawBerry Ridge is a manufactured home community that’s ideally situated for baby boomers who want to enjoy convenient access to the professional sports venues and potential job opportunities available in a major metro area. Moreover, this community’s close proximity to Tampa Bay also puts some of the best charter fishing excursions in the Sunshine State within easy reach. In short, purchasing one of the homes for sale in StrawBerry Ridge can help you enjoy all the activities you’ve dreamed of as you retire or prepare to devote more time to leisure activities. However, the advantages of living in StrawBerry Ridge don’t stop there. We also offer a generous number of resort-style amenities, including two clubhouses, indoor and outdoor pools, lighted tennis and pickleball courts, an aerobics room, a fitness center, a woodworking shop, and more. Daily access to all of these amenities and the organized activities they promote is among the perks that come with your purchase of one of the attractive manufactured homes for sale at StrawBerry Ridge and your low monthly home site lease payment. 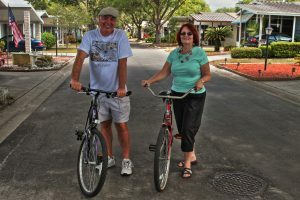 This is the way we make an active Central FL lifestyle affordable for almost any retirement budget. The homes for sale at StrawBerry Ridge include attractive preowned manufactured housing, much of which has been renovated and updated to meet contemporary tastes. There’s also an opportunity to have a new manufactured home, customized to suit your preferences, built on one of our select home sites. To learn more and to arrange a tour of this outstanding Central Florida community, contact one of our Lifestyle Consultants today.